We’ve finally got an encyclopedia in the game. I’m calling it the Codex. As always, we’re starting with the plain but functional look. Prettification comes later, after the design solidifies. It would be really nice to have a game where this wasn’t necessary – where absolutely everything was obvious, or invisibly taught to the player using some genius adaptive training system. And I get as close to this as I can. I work hard to make sure things are clear and comprehensible and pleasurable to interact with. I drop a lot of design ideas just because there’s no good way to express them, or interface with them. But despite all that, I think this is still the kind of game where people need to be able to just look stuff up when they want to find out how something works. For a while, I thought the game could teach players all the game systems on-demand, as necessary, in a semi-adaptive training sequence that would teach you things as by watching the game and deciding what you needed to learn next. I’ve discovered that this isn’t a complete solution. Sometimes, it’s just impossible for the game to figure out what the player wants or needs to learn. 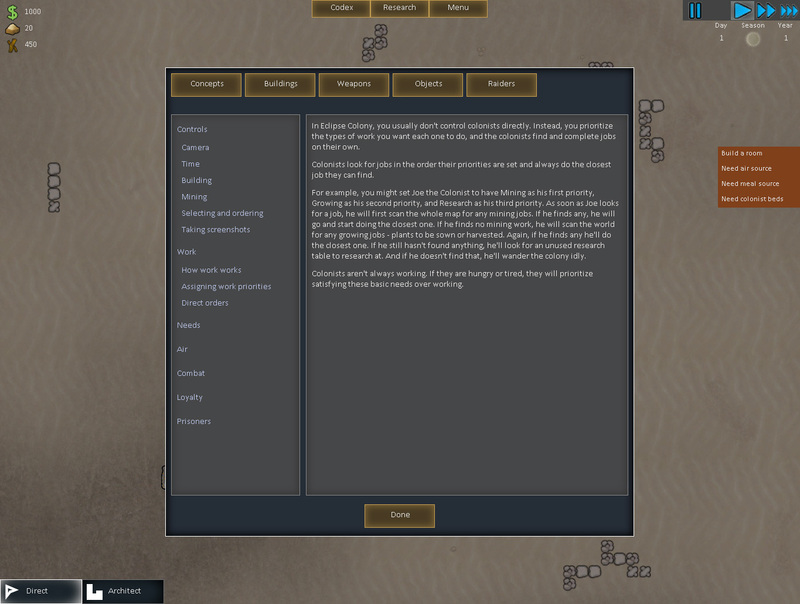 The system can tell when the player has no food source and needs to be taught about producing food. But I can’t tell when they’re, say, confused as to why their air is leaking out because they don’t understand the air system (because the game never taught them). There’s just one more major piece left in my recent usability push. I haven’t added much in the way of new world simulation in a while – it’s been all about making what’s there accessible. Hopefully after this next thing I’ll be able to get back to making the simulation deeper. I really want to get corpses in there, because there are so many interesting things that can happen with corpses.